Acts 13:38-39 – Let it be known to you therefore, my brothers, that through this man forgiveness of sins is proclaimed to you; by this Jesus everyone who believes is set free from all those sins from which you could not be freed by the law of Moses. 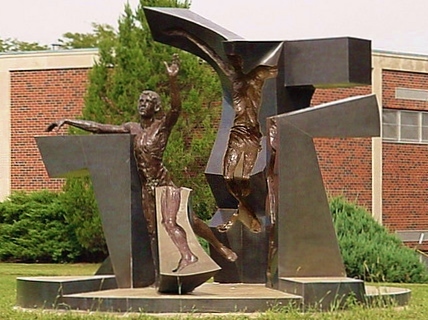 I attended Concordia University in Seward Nebraska, and on that campus is a sculpture named “Jesus Frees us” (In the winter it was also sometimes called “Jesus Freezes”). The sculpture shows a man (or every man) breaking free from a cross like shape. I love this sculpture, if not for its design alone, but for the message it gives to my heart. If you’re anything like me, you may have found yourself at different times in your life dealing with different sins. For different stages in my life I faced different struggles. Insecurity, identity crisis, complacency, lust, greed, gluttony and oh how this sad list could go on. Just as I think I start to have a handle on a sin, a new one was there to take its place. I’m not that bad, I don’t have a problem with sin. I think most of us have known someone who doesn’t believe they’re sinful. They feel like they don’t do anything ‘that bad” and they don’t need saving. For me that’s almost always a huge roadblock for further discussion, because if we don’t agree that we all do things that we shouldn’t do, that aren’t in our best interest, God’s best interest or our neighbors best interest, we’re sinners. Even those who don’t believe in God when asked if they’ve ever done anything wrong will (I think) say, “Yes” or maybe “Not very often”. When we compare ourselves to the laws of the land, it is hard for someone to say they’ve never missed the mark. Even in our self-serving society, we know that we’re expected to be kind to others, or at least not rude. But we have all at one time or another fallen short. We sin. Unfortunately for us sin leads to death. In our sinful world, without Christ there is only one outcome. Death. Death is the end for those who do not put their faith in Jesus Christ. That’s all they have to look forward to and they have no hope of anything better, in fact as unbelievers it can get much worse for them after death. But God gives us a free gift. He has saved us, by His own death on the cross from the sins that should condemn us. Instead of death, God has given us the gift of eternal life with Him. All those sins; I have been freed from all those sins. I no longer have to be contained and constrained by my short comings. I don’t have to live in the burden of guilt and the fatigue of being found out for who I really am. With the freedom God gives us, not only through eternal life, but by His conquering power here on earth, I no longer have to be a slave to my sins. As I keep my focus on Christ, I can be transformed into one who is continually improving and growing in my faith. As my faith grows, God willing I will make fewer sins and regrets. By this Jesus we are free!